How can I force SharePoint 2010 to open PDF's in the browser? In SharePoint 2007, clicking on a PDF in a document library would open it within the browser. In SharePoint 2010, doing the same asks me to save the PDF. How can I force SharePoint 2010 to just open PDF files without making me save them? Bad advice! You should not just blindly enable permissive mode. First of all, there are good reasons why SP2010 does not render files in browser, PDF included, per default. The reason is client object model. Read a thorough post of the potential dangers here. This change was made due to security reasons in SharePoint 2010. You know that PDF actually stands for "Potentially Dangerous Files". You can change it to a less secure mode, per Web Application, in Central Admin. Just change the Browser File Handling property to Permissive and your good to go. This is controlled by the installation of Acrobat itself, not SharePoint. By default, PDFs open in the browser but many corporate installs force it to open in a separate window for support reasons. Many users do not realize they are viewing a PDF instead of a web page and get confused when the normal web tools do not work properly. The bigger the corporation, the more likely this is to be the default. You could set the web application browser file handling setting to strict. This means that SharePoint will tell the browser to open the file in the client application, instead of opening it in the browser itself. I agree with Anders Rask that the solution provided by Wictor is not the best solution. Making it permissive at the Web Application level is the last thing to do. If you want to set permissive, it can be done at the Site Collection, Site and List level too. This will reduce the risk to a targeted area. 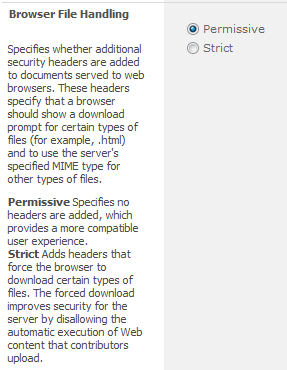 But note here that setting to permissive will allow other files to run in browser like flash etc. if you just want to allow pdf, then Anders's solution is good. Then do an IIS reset. Now the PDFs open directly into your browser without prompting you!